Garlic and lemon pan-fried salmon is a super easy and delicious meal that is perfect for weeknights as it can be made in under 30 minutes! It is also rich in omega-3 fats which is vital to brain function and our immune system. Heat olive oil and ghee in a non-stick pan over medium heat. Add the asparagus to cook for 3 minutes, stirring occasionally. Add the garlic and lemon zest and cook for a further 2 to 5 minutes depending on your asparagus preference. Top with sea salt and cracked black pepper to taste. Heat a medium sized pan over medium heat and add ghee and olive oil. Sprinkle some sea salt on the salmon fillet and place on the hot pan with the skin facing up. Cook for 4-6 minutes (depending on salmon thickness), and carefully turn over to the other side. Cook for three minutes, then add the garlic and lemon juice and cook for a further 2 to 3 minutes until salmon is cooked through. 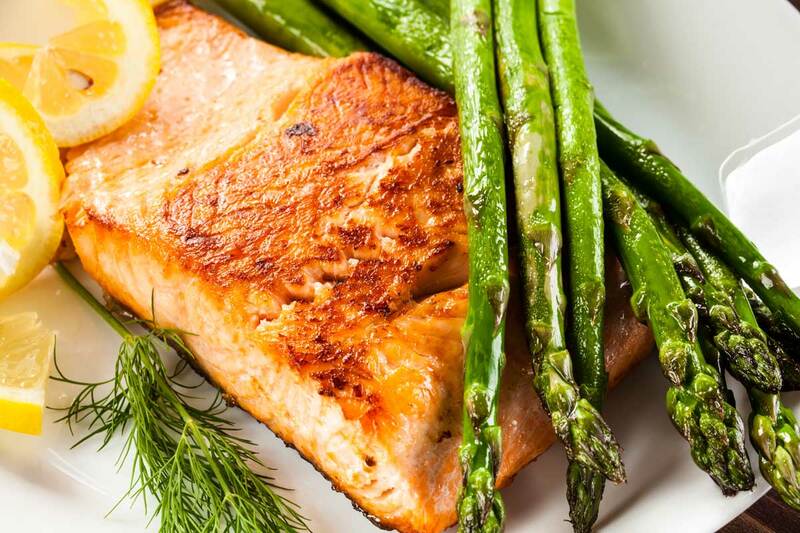 Assemble salmon and asparagus on a plate. Serve and enjoy!